If you're starting to develop a personal development plan, here are four simple steps to follow that make it safe and easy. Starting the process of developing a personal development plan can be a little overwhelming at first glance. Some of those samples, examples and templates go on for pages and pages. My objective is to make your getting started simple and easy and that's what we'll talk about here in this personal development article. 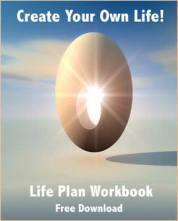 If you're new to personal development and want to know more about the personal development process in general, you can download my free PDF personal development - life plan workbook which gives you detailed instructions on how to get started with your new life plan. Now, let's take a quick look at why you need a personal development plan in the first place. And it shows which roads to take to get there. It's like traveling to an unknown place. If you don't “plan your route,” then how will you get anywhere? How will you accomplish your true dreams and desires if you don't have a map (either complicated or simplified) to achieve them? Contrary to what some people may think, dreams don't just magically happen one day without focus, energy and action. And learn what techniques we should use to get there on time! Studies have shown that people who have set goals early in life, like in their mid 20’s to early 30’s, are able to achieve these goals before they reach the age of 40. If you're reading this and are already past 40, the good news is that once you make up your mind and set goals now, you're more likely to have the life experience to attain those goals even faster. And it's also well known that people – at whatever age – who write down their goals are in the elite 3% group of the entire population who actually realize their goals. Just by simply writing them down, this makes goals tangible. It's like they've begun their manifestation into existence because they “exist” on paper! So, if it's true that setting goals and writing them down lead to increased success, taking the time, energy and focus to develop a personal development plan will catapult you in the direction you want in life faster and easier. One of the first benefits of creating a plan for personal development is that you can set objectives that will tell you why you need to do what you are doing. It also sets certain expectations on your part that will lead to positive results. You'll know exactly why you are taking each step and you'll know with certainty that you will reach your life goals. Rather than being “blown around by the wind,” having a plan helps you lay out certain ground rules to live by. This will enable you to set certain boundaries, brainstorm on strategies and organize your schemes so that you will be ensured ultimate success in the end. In other words, it keeps you focused and when you give something focus, energy and consistent attention, you've just dramatically increased your rate of success! Your plan, can also serve as your checklist. You can mark the things you have already accomplished and always be reminded of the things that need to be done. It is always good to have a list that prompts your next steps and tasks. It gives you enough facts and details to work on so you can formulate your strategy and master certain skills. Your plan will certainly serve as a guide for you so that you can be more efficient and make it faster for you to reach your goals in no time. By focusing on your progress, rather than “lack” of progress, your thinking tends to “default” to the positive more often. Then the benefits of positive thinking kick in and before you know it, your body is addicted to the new thought patterns and you're “positively” having a great time with your personal development endeavors. For one week, notice where you spend your time and make notes. Are you spending time complaining or are you figuring out how to solve that problem. How much time do you spend commuting, doing housework, caring for children, working, etc. Just notice, don't change anything. Categorize where you spend your time. Sample categories would be: Work/career, family/relationships, physical health, mental health, spiritual health and dreams/desires. Is this how I want this area of my life to be right now? If not, if I do nothing to change this, where will I be in 5 years? 10 years? Sit quietly alone for 15 minutes a day for a week and journal your thoughts and ideas about these thoughts and questions that come up. Once you've done this exercise, you've started the first step in identifying your heart's desires, as well as gently starting your personal development journey. Along the way, you may need to do some improvisation, but this does not take away from the fact that you need a plan you can revise, or tweak, because if you don’t have it in the first place, what strategy or steps will you amend? Indeed, to develop a personal development plan is one of the best ways to be organized and to keep "tunnel vision" maintained towards your goals. If you combine this with a positive outlook in life, you will see this vision becoming reality sooner than you expect. Download my free PDF workbook that gives you more information on how to develop a personal development plan, how to customize your plan and gives you other tips on personal development and positive thinking.